Besides detecting mites in brood and clean them from there, grooming mites from each other and bite them is also an important trait for bees fighting mites. Here a mite that has got some legs bitten. It will soon die after such treatment. 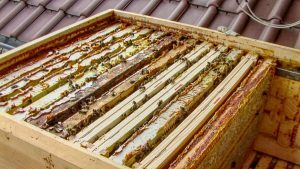 Treatment free focus in beekeeping is a growing movement in Germany, like in many other countries. This can be done in harmony with the legislation in almost all countries, if not all. 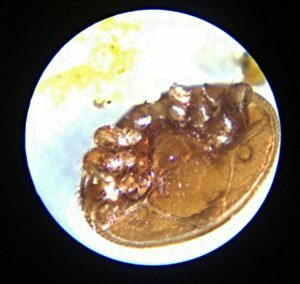 Most legislations require treatment against the varroa mite, so people have come to think that they must treat every year to follow the law. Now many have discovered that prophylactic treatment (before it’s actually needed) is almost never required, if anywhere. This means that to be able to be treatment free and keeping the law, you need to monitor the varroa level. If it’s below the threshold level, the mites create no problem for your or your neighbor’s bees, and no treatment is needed (yet?). The threshold level recommended by authorities is today in a climate similar to ours (Canada) 2% (two mites on 100 bees) in May and 3% in August. http://www.omafra.gov.on.ca/english/food/inspection/bees/varroa-sampling.htm An IPM PP-presentation from the university of Delaware: http://alturl.com/ed92e is focused also on developing resistant bees and management methods. You can find threshold values of 5% for the middle of the summer from universities in America, but that is probably to high for bees with weak resistance traits. If the varroa population is above the threshold, the conclusion is that you have to take action to help the bees lowering the mite level. This can in many cases be done without treatment chemicals (drugs, essential oils or organic acids), but instead with other means. 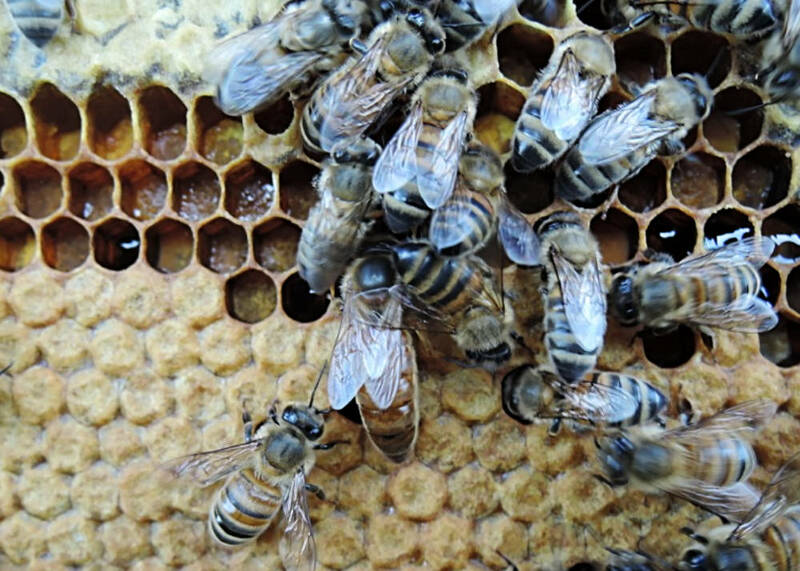 Monitoring can be done through checking natural downfall, looking for DWV bees (virus damaged bees) in front of the entrance or on brood combs, doing alcohol washes or sugar dusting. 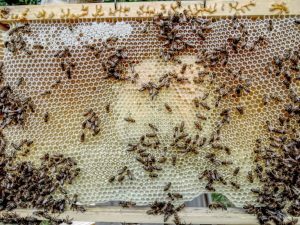 An effective treatment without chemicals – oils, acids or drugs – is removing capped brood, worker or/and drone. This of course effects the growth of the colony, but you can get a much worse effect by doing nothing at all. Also making artificial swarms is a way of preventing mite growths. 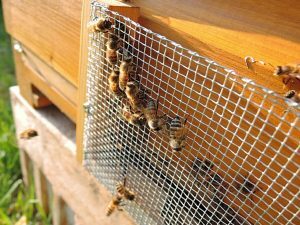 An important reason why you want to avoid the use treatment chemicals is that these interfere with the bees’ epigenetic adaption to rid themselves of mites. This should be followed by replacing the queen in colonies with the worst problems with a queens bred from a more resistant colony. Also it’s important to let resistant colonies produce splits as well as a good amount of drones for the virgins to mate with. Two beekeepers in Germany who work together according to these principles are Stefan Hutterer and Sibylle Kempf. They are active in a beekeeper group and on forums. Sibylle also makes many good comments on my blog. Here they give us reports from their season of 2017. 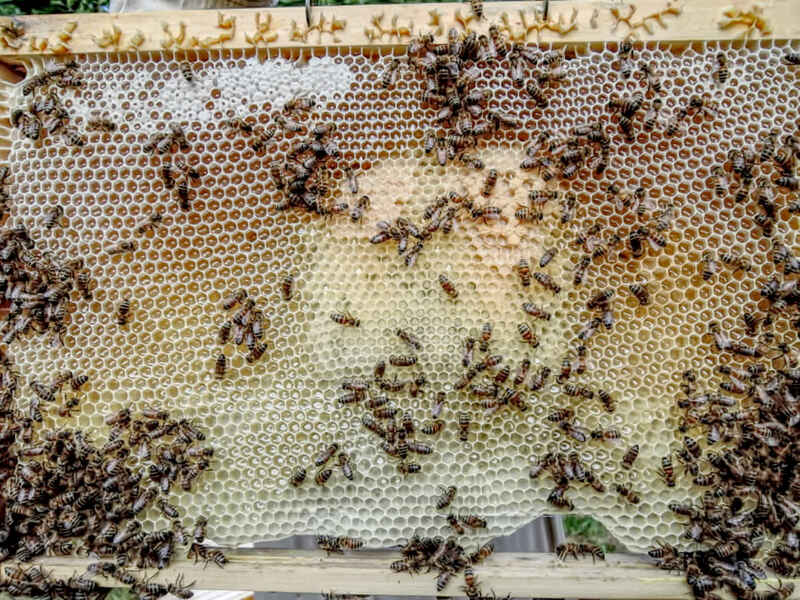 I´ve been keeping bees for 10 years now and decided in 2012 to regress one hive to small cell (SC) comb with the help of plastic comb (Mannlakes standard plastic comb https://www.mannlakeltd.com/shop-all-categories/hive-components/frames/plastic-frames/standard-plastic-frames ). That worked well, but the pure bred carniolans which I had could not follow the imprint of the cells on small cell wax foundation. Plus, which I think is important, they used no propolis. They were very susceptible to pests and diseases too. 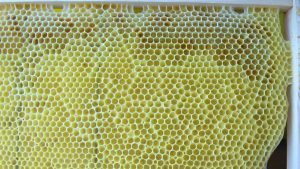 The carniolan bees couldn’t follow the small cell pattern on the wax foundation and made a messy construction. I wanted to be treatment free but I realized that in the end the only way to reach this would be to use a bee that had traits that had showed more success in this area. 2013 I ordered my first elgon queen from Josef Koller without expecting too much. I was curious how they would perform. This first Elgon colony survived winter very well and built nice 4.9 mm cellsize (SC). 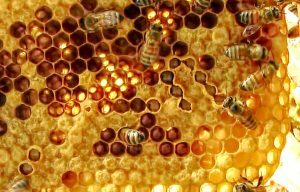 I think it’s important that bees do produce propolis to help them stay healthy. Here’s some applied on the top bars fo a mix of wooden and plastic frames in an elgon colony. Mating apiary with Stefan. Apideas placed 4 and 4. Drone producing colonies in the traditional type of bee house. I bred some daughters, thus making F1-colonies as they mated with carniolan drones and introduced them in Carniolan nucs. 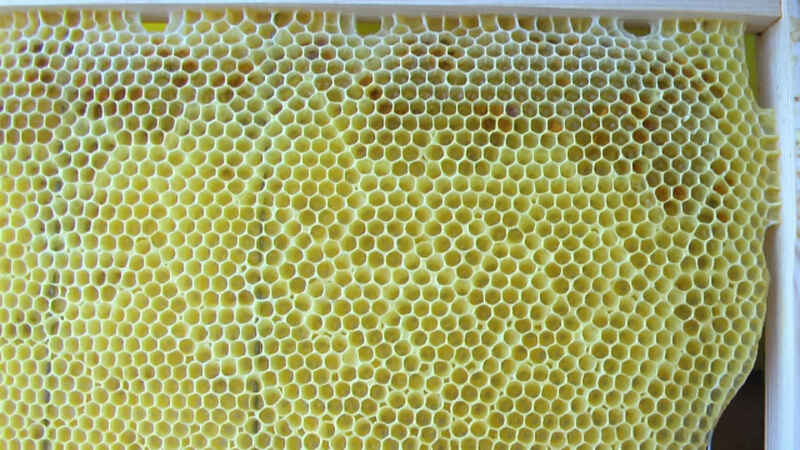 The more new bees that hatched in these nucs, the more they became lighter in color and less grey. I was impressed by the gentleness of the bees, and at the same time different in comparison to the carniolans as they were very defensive towards wasps and foreign bees and watched the entrances ferociously. Still, working with them was nice. They started making brood later in spring than the carniolans, but I never had an elgon colony isolated from stores in winter or starving. They know how to househould with their food resources. 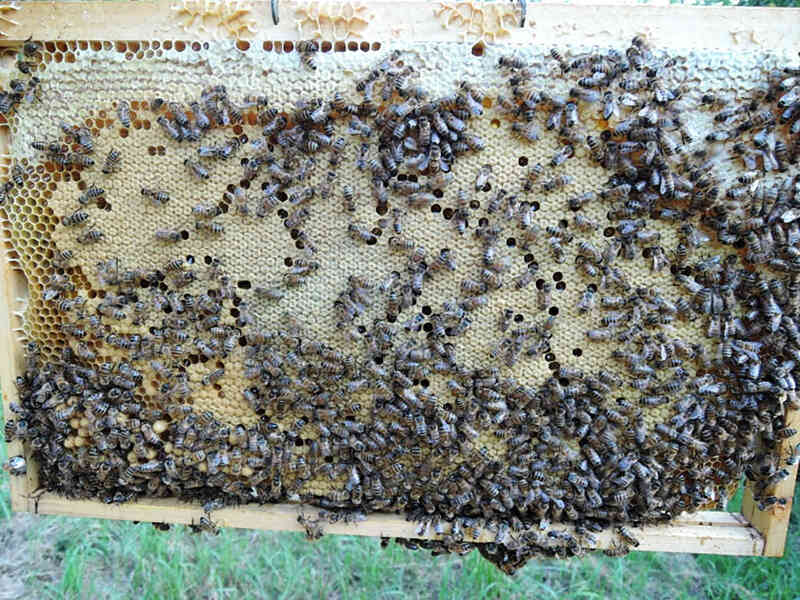 An elgon comb where the bees have uncapped cells with worker pupae as a way of fighting varroa. 2015 I got two pure bred elgons from Erik Osterlund in Sweden through a couple of friends, members of the ResistantBees Forum of Stephan Braun, La Palma. Now, 2017, I have only treatment free small cell bees except two large cell (LC) Carniolan hives. I´m living in an area flooded with carniolans and I´m not isolated. This will not change. I also keep survivor colonies of unknown origin in my beeyards, but I know that I must propagate the best genetics to stay being treatment free. So I breed every year from one or two pure bred elgon queens and shift all unsuccessful queens to better ones. I therefore this season bought two elgon queens directly from Sweden with the intent to use them the coming season. My friend Stefan Hutterer and I started to work together and use the elgon bees because we realized they are less susceptible to diseases and are fighting more ferociously against the mites. They are more gentle than the imported Apis mellifera mellifera (AMM) we tried, and bring in more honey. These traits will hopefully convince other beekeepers to try treatment free beekeeping too. 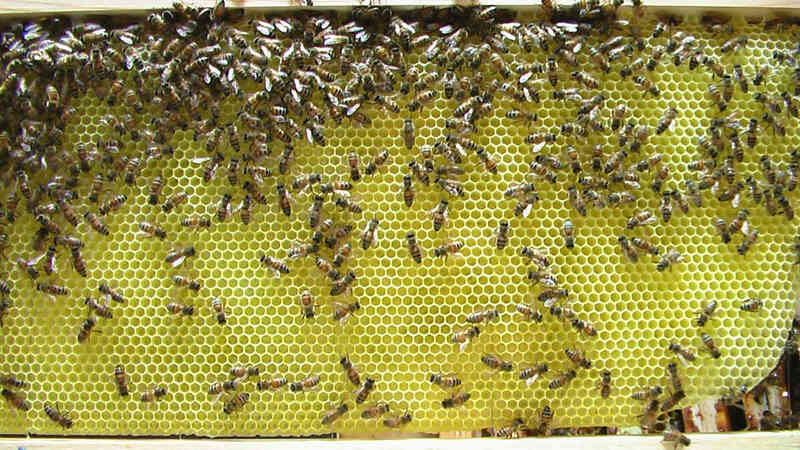 A nice brood comb in an elgon colony. A pure elgon queen mated with local drones giving a F1-colony. 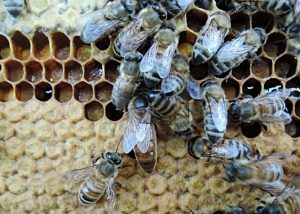 To get elgon genetics in our beeyards, we purchase pure bred elgon queens, now directly from Sweden and breed virgins which are allowed to mate with drones of our local adapted bees, which are the carniolan crosses mostly but some buckfast combinations, and a growing number of elgons. So far the elgon crosses keep their good traits but we plan to introduce pure bred queens with not too long intervals. Stefan has kept elgons now for 3 years. We are trying to use foundationless naturally drawn comb to have locally produced clean wax. The elgons promptly built small cell natural comb in the brood area. The carniolans were not able to do that very well, probably because they are being bred on an unnatural cell size of 5.4 mm in the brood area for a long time. Some members in our group will use well built small cell comb to regress the local hybridized colonies down in cellsize and try natural comb later. I had big losses in winter 2016/2017. I went from 14 hives to 4. Four of the losses were the result of mite infestations. The others were due to bad matings and isolation of the cluster from food stores. I went on and made splits from the survivors. Now in the autumn of 2017 I have wintered 12 hives. I got one colony from Stefan. Another one is a swarm with large cell (LC) bees I caught, which I now regress treatment free to small cells (SC) in my garden. My SC colonies are placed in apiaries with only my SC bees. Besides the LC swarm 4 are of the AMM mother line, 5 Elgons and 2 carnica crosses of survivor type. I realized, that making strong splits with a lot of capped brood and a laying queen are “mite breeders“ in our environment, so I have tried other methods to make new colonies. This year I made small splits when doing them with laying queens and gave those only a few brood combs and some with food. Splits without an egglaying queen but with a virgin queens or a ripe queen cell were made strong. All splits got robber screens in front of the entrance to prevent robbing. 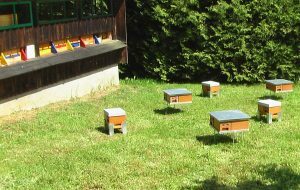 When splits are placed in the same apiary as the one the bees were taken from all field bees flew back to the mother colony and left them defenseless against robbery. But the robber screens are good help against robbing. 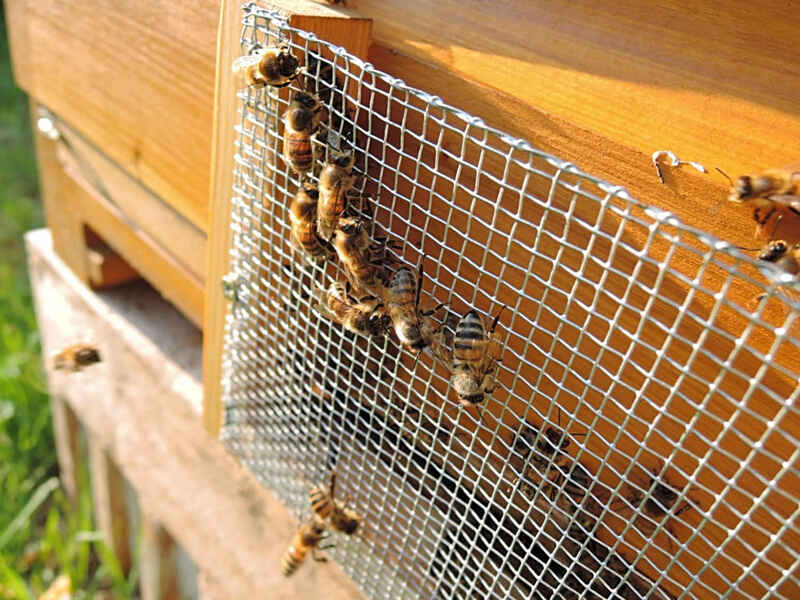 Robber screens prevent robber bees from other colonies to interfere when introducing a new queen in a nuc or split. May 16, I made a small split with my F1 elgon queen (pure elgon queen mated with local drones) I got in 2016. In the “middle” of the broodnest with 3 brood combs (no drone brood on those) I put a foundationless frame with just a starter strip of foundation. I was happy to see that in the middle of the comb they built naturally almost perfect small cells. The small elgon split made small cells in the middle of a foundationless frame, which area the bees used for brood. I have also had too much space during winter for the bees. I will change that. The bad matings were a result of the unfavorable weather situation in 2016, so I have to watch more carefully the time for breeding new queens and having them mated. There must be enough high temperature and enough amount of mature drones. Beekeeping situations always change. To have success you must adapt to the needs of the bees and what nature tells you and develop a sensibility for this. This is hard work for me but when I see the beautiful elgon bees and the dark feral looking ones I have, the descendants of the AMM and still some carniolan crosses survivors I have, I enjoy every day learning from them. 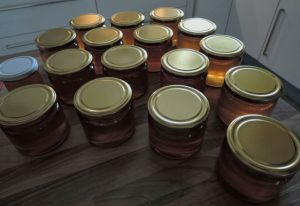 After the colonies had been allowed to keep honey for winter stores Sibylle was able to secure a small crop for herself. 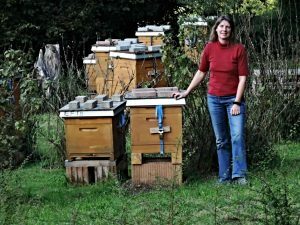 Sibylle Kempf in one of her apiaries. 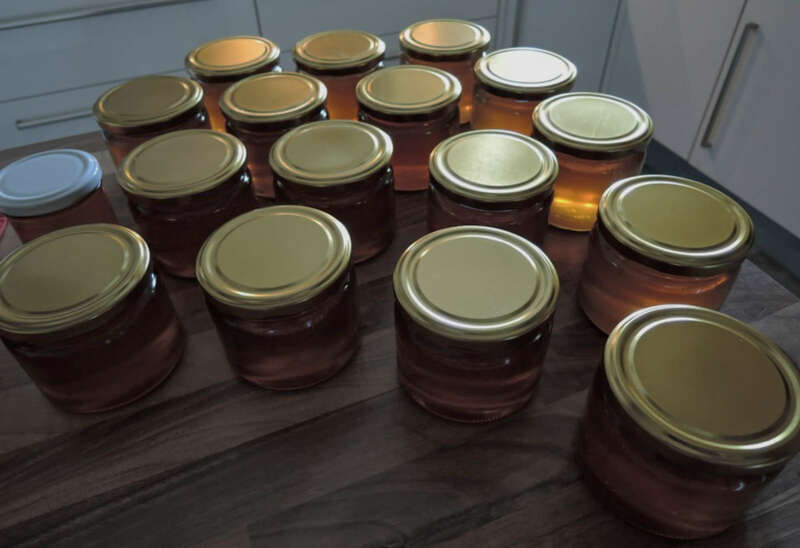 The small harvest of honey I took after leaving the bees enough of their own honey for stores is a most wonderful compensation. Thank you, bees. This entry was posted in Breeding, Cellsize, Disease resistance, Elgon, Management, Treatment free, Varroa level, Varroa resistance by Erik. Bookmark the permalink. This is very interesting. The website link in this article does not work, at least for me. Could you possibly check this? Thanks Heidi. I understand it’s the vivabiene.de link. I have fixed it now. Many thanks. 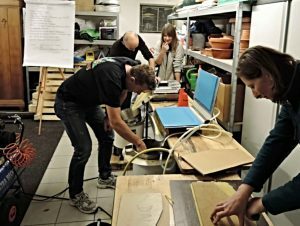 Most interesting to read about this work going on in Germany. This year I’ve set up 11 colonies with 5,1 and 4,9 mm foundation. I monitor the mite fall during autumn and winter from 18 colonies in my backyard bee colonies. 3 of the 18 do have 4,9 mm cells. Until now these 3 colonies are part of 6 colonies with the lowest mite fall average per day. During the winterseason I’ll move 10 colonies with 4,9 or 5,1 mm cells to a separated bee yard in a forest. In Spring they will get aditional 4,9 mm foundation and the test with 10 colonies with small Buckfast bees can start. 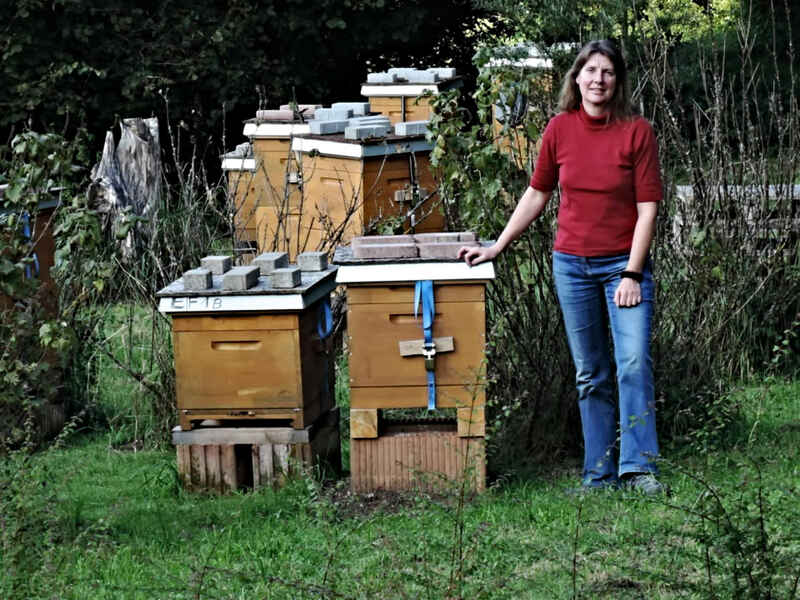 Glad to see there are more beekeepers focusing on helping bees to live naturally and healthy. Thanks for sharing. Wonderful article. Thank you for sharing. Keep up the great work! my question: from where i can get elgon queens in 2018 ? Hello Pita. Send a mail to elgonbee(at)gmail.com and ask. You can also ask Josef Koller. http://www.josefkoller.de That would be somewhat cheaper. He has good bees.